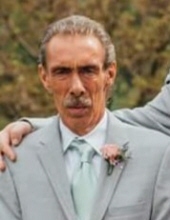 Owen Ronald “Ronny” Hedgecock, 56, of Fieldale, VA passed away Sunday, October 21, 2018. He was born February 25, 1962 in Martinsville, VA to the late Oscar Raymond Hedgecock and Ovilla Marie Hedgecock Hopkins. In addition to his parents, he was preceded in death by a brother, Emery Hedgecock. Ronny worked for Duncan Ford in Rocky Mount, of which he has been working in the industry of body work for 40 years. He was of the Baptist faith. He is survived by his daughter, India Lonney (Dr. Jason Looney) of Danville, VA; grandchild, Kairi Star Looney; sister, Rayna Hedgecock Boothe (Sherman Boothe) of Stuart, VA; and brother, Richard Randall Hedgecock (Jeannie Hedgecock) of Martinsville, VA; and several aunts, uncles, nieces, nephews, and cousins. A funeral service will be held at 2 p.m. on Thursday, October 25, 2018 at Norris Funeral Services, Martinsville Chapel with Pastor David Deisher. Visitation will be from 6 p.m. to 8 p.m. on Wednesday, October 24, 2018 at Norris Funeral Services. Burial will be at Oakwood Cemetery. Norris Funeral Services, Inc. and Crematory of Martinsville, VA is serving the Hedgecock family. To send flowers or a remembrance gift to the family of Owen Ronald "Ronny" Hedgecock, please visit our Tribute Store. "Email Address" would like to share the life celebration of Owen Ronald "Ronny" Hedgecock. Click on the "link" to go to share a favorite memory or leave a condolence message for the family.